Bowls are great for tiny critters like Snails & Shrimp but are they great for Tropical Fish? And if so what kind of fish can live in a bowl? I hope to help you answer those questions but first, to be brutally honestI don’t like bowls! They are too small, get dirty too fast, difficult to scape and most people don’t take the time to research bowls before jumping in. That said, if you have some experience with keeping fish in smaller tanks successfully then a bowl may work for you. So What Kind Of Fish Can Live In A Bowl? What If I Want To Keep Fish In A Bowl? bowl? So Which Fish Can Live In A Bowl? 5. Salt and Pepper Corydoras. Most bowls are too small to have things like lights, filters, bubblers, and decor so I recommend you look at fish that are very hardy, small and possibly cold water species of fish. Well, bowls can become toxic very quickly and depending on the size and fish you keep you may require daily water changes and if you miss even one water change it could be deadly. Hardy fish like white cloud minnows may be able to handle the water parameter swings. I think this is pretty self-explanatory but small fish require less space and water. Some nano species of fish like Scarlet Badis may be good options for bowls. In most cases, it will be difficult to have a bowl with equipment like heaters, filters, and lights. If you don’t have a heater then you don’t want to have fish that requires a steady temperature of 78F like a Betta Fish if you can’t heat the water. I’ve seen bowls as large as 10 gallons and you can find some small heaters like this one on Amazon that can be used in a bowl. So there can be exceptions to the rule. Also, a small sponge filter could also be used along with some live plants. The sponge filter will provide a place for the good beneficial bacteria to grow, will help aerate & move the water around and the live plants will help remove some of the nitrates in your water. Here are a few bowl setups that would be great to copy. Here is an example of a great little Betta bowl set up from Foo The Flowerhorn. This bowl is around 7.5 gallons, 6 months old and doesn’t use any filter, ferts or C02. 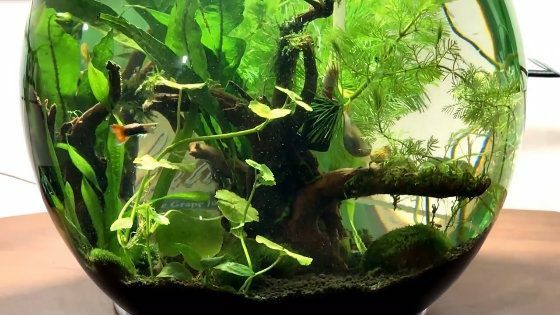 Here is a great planted 3-gallon bowl set up with a few guppies from Heisenberg with a few plants like Java fern, Java moss, Christmas moss for a really stunning example of what can be done. Now that we’ve covered off the key things to keep in mind when keeping fish in a bowl, it’s time to get to the fish. To get a few more ideas for smaller bowls that are 2.5 gallons or less. 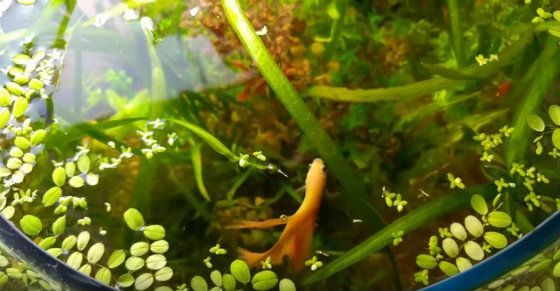 You can read my post on the Smallest Freshwater Aquarium Fish that can be kept in nano tanks. If I had to choose one small fish for a bowl I’d go with something like the white cloud minnow. They are small but very active fish that have little red fins and like to swim in schools. They are super and I mean SUPER HARDY fish that can sustain pretty large swings in water quality. So if you don’t use a filter or forget to clean the bowl they may be able to live through the hell. They also thrive in cold water so if you can’t use a heater they will be fine, but they also do just fine in a bowl with a heater so you can go either way. Lastly, they are very friendly and peaceful fish so if you want to add a few snails or shrimp to the mix they won’t attack the little guys. You could keep 3-5 white cloud minnows In a 4-gallon bowl with some live plants and it would look awesome.